Energy-efficient indoor air quality that stimulates productivity — Andy Cardy. Good indoor air quality is essential in commercial applications to maintain productivity and comfort. Andy Cardy of Fläkt Woods, looks at how building-services engineers can optimise working environments while reducing energy costs. Throughout the year, the British weather effects the UK workforce in a number of ways — especially those who are based inside. From overheating in the dry, summer months, to coping with damp and stale air during the winter, maintaining a comfortable indoor environment in commercial properties is a challenge. But whereas existing buildings might have to rely on opening a window or wheeling out mobile air-conditioning units, new-build properties can incorporate a range of products to keep a workforce, comfortable, productive and healthy. As UK Building Regulations drive the designs of new properties to become increasingly airtight, degradation of indoor air quality is becoming a problem. And, for occupants in commercial premises, it can often trigger a notable reduction in productivity and comfort levels. So, designing an effective system for all months of the year is essential for building services engineers. Meeting the challenges to maintain good indoor air quality is complex. First, a common situation is for occupancy levels is to be higher than the designed conditions for ventilation rates, resulting in poor removal of stale air and the concentration of pollutants in the space. When combined with a high density of people in a relatively small space, this can also cause a number of issues, such as higher levels of odours and noise or increased transmittance of colds and flu. Other challenges include maintaining moisture levels and minimising energy usage. Achieving the ideal indoor climate requires building-services engineers to take an holistic approach to system design, while considering a combination of several factors. 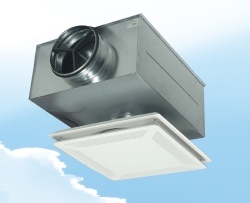 These include ventilation, temperature, humidity, air purity and noise. Demand-controlled ventilation has long been an efficient approach to keeping ventilation rates and temperatures at the required level. This can be achieved by carefully specifying a range of products — such as air handling units (AHUs), axial/centrifugal fans, and air-terminal devices (ATDs) – that can intelligently ‘communicate’ with one another to provide the optimum air quality. One of the most important (but often underspecified) components of a system is the air terminal device or room diffuser. Improving every aspect of a system can provide some useful energy reductions, which is why manufacturers such as Fläkt Woods have developed ‘active’ room diffusers. These not only improve the performance of demand-controlled ventilation systems, but also maintain excellent comfort levels for occupants. By regulating air distribution and controlling flow rate, these room diffusers can ensure a constant air throw. In addition, where occupancy rates increase (a common occurrence in an office environment) and a higher ventilation rate is required, the diffusers can adjust air-discharge velocity accordingly. While demand-controlled ventilation is an effective way to manage air quality, incorporating energy-recovery units is now a popular approach to reduce the overall energy consumption. The latest units provide impressive savings by integrating counterflow heat-exchanger technology which can deliver thermal efficiencies of 90 to 95%. In colder months, this type of system extracts the energy from the warm, stale air exhausted from an office, school or hospital, for example, to preheat fresh incoming air. The result of this process is a healthy boost to the overall energy performance credentials of the building, as well as the indoor air quality. Configuring energy-recovery units to work in harmony with a building-management system can also help air quality and supplement any demand-controlled strategy. Furthermore, air quality sensors can be added to a unit to control CO2 as required in BB101, which covers ventilation and indoor air quality in schools. This concept can also overcome the problem of overheating in the summer months, which has become a major issue in building design. As a result, in July 2013, CIBSE launched a new guide, ‘TM52: The limits of thermal comfort: avoiding overheating in European buildings’. With ever-increasing energy costs, there is a greater need to reduce a commercial building’s reliance on fossil fuels. 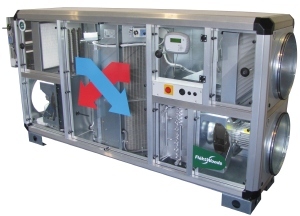 Energy-recovery units with 100% summer bypass can help reduce overheating by, first, ensuring hot air is diverted away from the heat exchanger and, secondly, by promoting free cooling when the ambient temperature falls below design conditions. Room diffusers are one of the most important components to achieving good indoor air quality. Maintaining good air quality in commercial properties will be a significant consideration in the design of new buildings well into the future. Consequently, demand controlled systems, intelligent ATDs and energy-recovery units are all likely to play a major part in ventilation strategies in the long term. However, they will need to be carefully balanced with the overall running costs, requiring building-services engineers to consult manufacturers that can provide an entire indoor climate solution. Without such a consideration, the problems of poor indoor air quality could greatly reduce the productivity of occupants, with the potential to undermine a business’s revenues. But more importantly, it could impact upon everyone’s prosperity and well-being, which needs to be avoided at all costs.